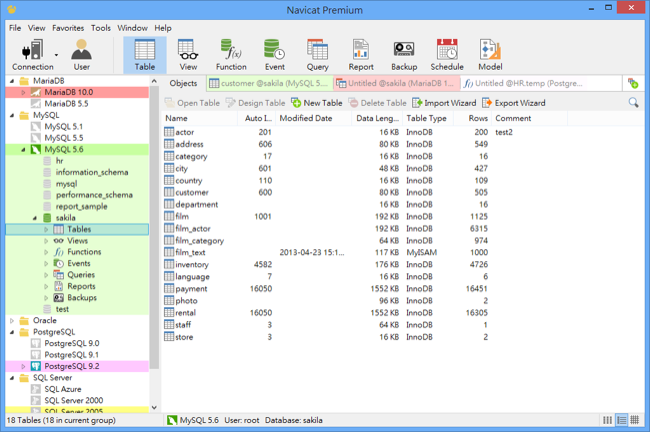 Navicat Premium is a various database management tool for developer to concurrently connect to MySQL, MariaDB, SQL Server, Oracle, PostgreSQL, and SQLite databases from a single application. It includes functions of other Navicat products and supports most of the features. Navicat Lite is a multi-connections Database Administration tool allowing you to connect to MySQL, SQLite, SQL Server, Oracle and PostgreSQL databases simultaneously within a single application, making database administration to multiple kinds of database so easy. Navicat for PostgreSQL can connects users to any local or remote PostgreSQL database servers from version 7.3 or above and supports all PostgreSQL database objects. With the Navicat Cloud Services, they can sync settings and queries to the cloud in order to exploit the working productivity. Navicat for SQLite is a powerful and comprehensive GUI provides a complete set of functions for database management and administration. It offers tools for data editing, SQL query and data modeling, Major features include Data Transfer, Import/Export, Data Synchronization, Report and more. You can be the first to write a review of Navicat Premium (Linux) - the best GUI database administration tool!